Club passing at the festival. On May 5th, the 2012 Ann Arbor Juggling Arts Festival returned to the Wide World Sports Center for its annual event. 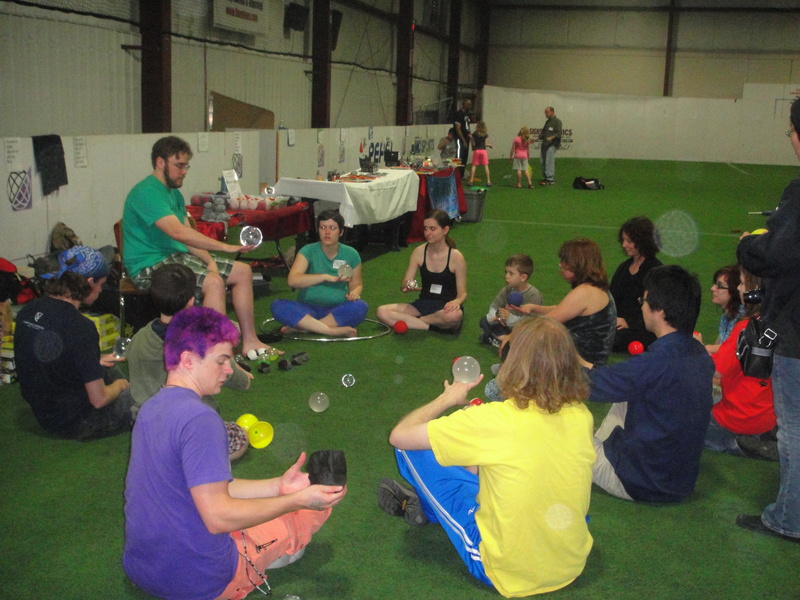 The festival has long since used this venue, as the center is very conducive to juggling, with its large indoor soccer field and high ceilings. It was also a very good value for only two dollars to gain access to the facility’s festivities for the whole day. You just had to be careful not to get the synthetic dirt in your shoes from the soccer field. There were more vendors with tables this year than there has been in recent years. Ann Arbor’s own anti-gravity shop Gravitas Juggling was there selling assorted juggling supplies and flying disks. The Outdoor Fun Store had slacklines for sale of varying sizes. Superior Performance Juggling and Hercules Juggling shared a table, selling chain mail and weighted balls respectively. The Ann Arbor Magic Shop’s table sold a few miscellaneous magic tricks, and The Wunderground Magic Shop had DVDs/books in addition to various juggling props for sale. Activities throughout the day included workshops and games, which were very successful and well attended this year. The workshops ran in half hour increments throughout the day from noon until 4pm. 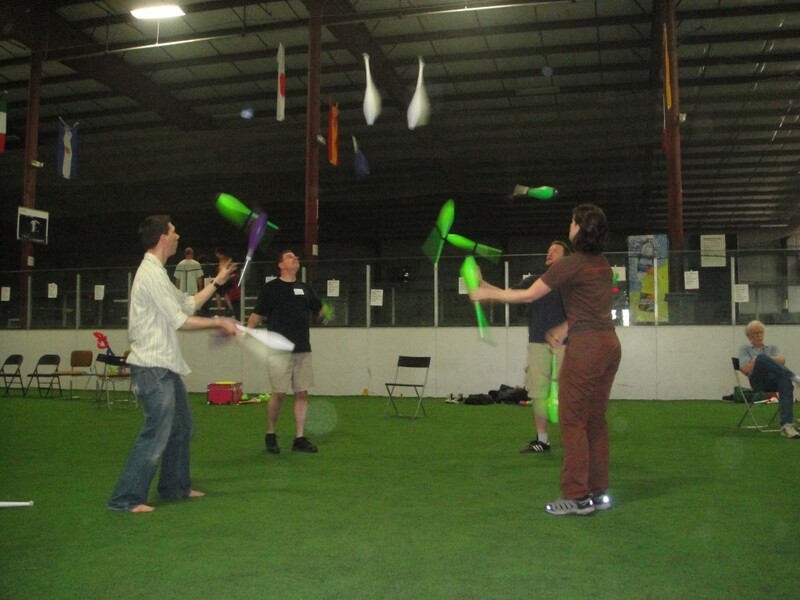 Their topics ranged from beginning poi, club chin rolls, contact juggling, three ball tricks, and claymotion juggling. The games varied from the more technical competitions like five ball endurance and seven club passing, to more laid back games such as juggling limbo, quarter juggling, and juggling jousting (which involved trying to maintain a two ball fountain with one hand while you attacked your opponent with a fun noodle with your other hand in an attempt to get them to drop). 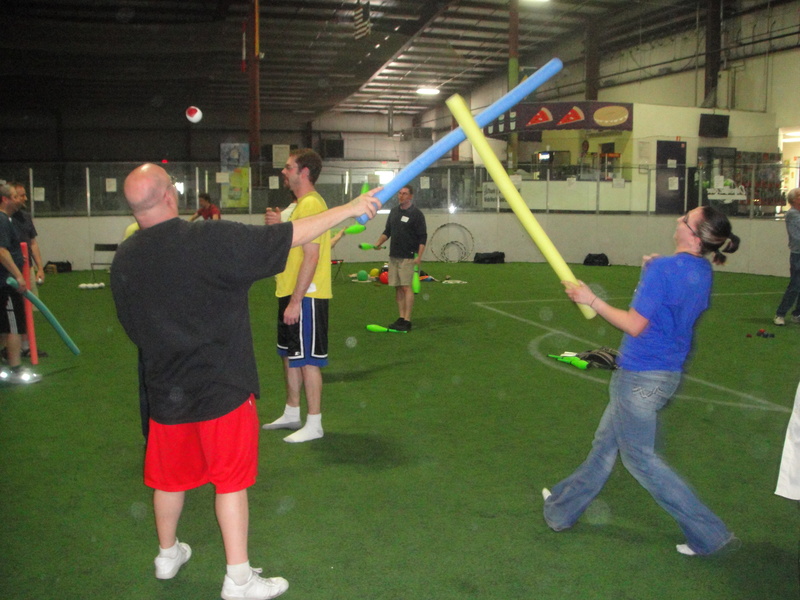 There were also several impromptu games of combat played throughout the day, including zombie combat. 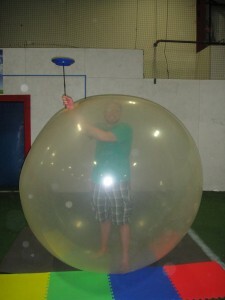 Several notable occurrences that happened throughout the festival included David Cain entering five ball endurance with five clubs (and outlasting several of the competitors), a festival goer climbing inside a giant balloon that was inflated with a leaf blower, and a slackline being set up on some posts just outside of the field area for festival goers to try out. After the festival concluded, many of the jugglers went out to dinner, and then met up at the after party. The after party included a bonfire, snacks, and there were glowballs and glowpoi for attendees to play with as night fell. For a one day event, the festival seemed very successful this year, and is likely to return again to the same venue next year in early May. Man inside a giant balloon holding a spin plate.